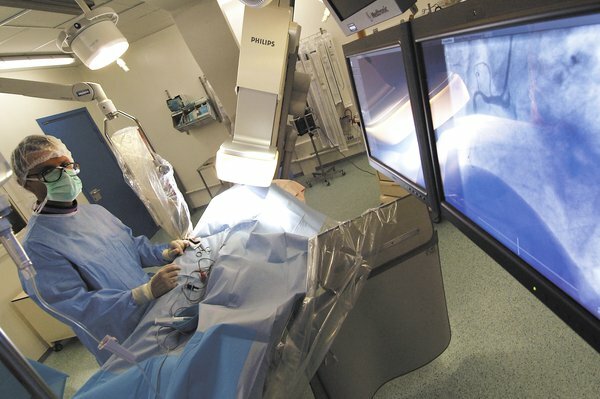 Cardiac catheterisation and coronary angiography is carried out at a hospital or specialist heart centre. The procedure is usually carried out in an X-ray room or a catheterisation laboratory. You'll be told whether to continue taking your medication or if you need to stop. You shouldn't stop taking prescribed medication unless you're advised to do so. You may also be asked not to eat or drink anything for a few hours before the procedure. The procedure is usually carried out under local anaesthetic, so you'll be awake while the procedure is carried out, but the area where the catheter is inserted (either the groin or arm) will be numbed. You may also be given the option of having a sedative. This makes you feel sleepy and relaxed while remaining awake and being aware enough to respond to instructions, such as being asked to take a deep breath and hold it at certain points during the procedure. General anaesthetic is sometimes used when young children need to have the procedure. This is because they may find it too difficult to stay still while it's being carried out. You'll be attached to an electrocardiogram (ECG) machine throughout the procedure. An ECG records your heart's rhythms and electrical activity. A number of electrodes (small metallic discs) are placed on your arms, legs and chest. The electrodes are connected to a machine that records the electrical signals of each heartbeat. If you don't need any further procedures, such as balloon angioplasty, cardiac catheterisation and coronary angiography should take about half an hour. Here's a step-by-step guide to what you can expect during the procedure. The healthcare professionals who are with you will explain what's happening. After entering the catheterisation laboratory, you'll be asked to lie on a special table. If the catheter is being inserted into your groin, your groin may be shaved and cleansed with antiseptic fluid. You'll be covered with a sterile sheet and given an injection of local anaesthetic to numb the skin of your groin or arm, so the procedure shouldn't be painful. A small cut (incision) will be made in your groin or arm and a fine tube called a sheath is inserted to hold the blood vessel open. The catheter will be moved through your blood vessels and into your heart using X-ray guidance. A small amount of dye called contrast medium is injected through the catheter and the pressure in your heart will be measured. As the dye is injected, you may feel a hot flushing sensation that passes quickly. You may also experience a warm sensation in your groin that feels as if you have wet yourself, or you may have a metallic taste in your mouth. This is nothing to worry about and you'll be warned when to expect it. You won't feel the catheter being guided through your blood vessels. But you may be aware of the odd missed or extra heartbeat. A series of X-ray images are taken of your heart and the blood vessels around it. These are called angiograms and will be stored on a computer. In certain circumstances (for example, if your arteries are blocked) your cardiologist may decide to carry out a balloon angioplasty (a procedure to widen blocked arteries). This will be carried out immediately and adds about an extra hour to the procedure. This should have been discussed with you beforehand, unless it's needed as an emergency procedure. The catheter and sheath will be removed once the procedure is complete. If the catheter was inserted into your groin, the nurse or cardiologist may apply pressure to the entry site for about 10 minutes to stop any bleeding. Alternatively, a number of different plugs, stitches or clips may be used to seal or close up the wound. If the catheter was inserted through your arm, a tight dressing or cuff may be applied for around 2 to 3 hours.